In order to stay ahead of the competition, tennis players are always looking to find better equipment which will give players the upper hand over their competition. Wilson is constantly answering this call for improved tennis gear and the Wilson Pro Staff Six.One is a shining example. The Wilson Pro Staff racquet is a brand new design which is leading the field of tennis racquets. In the recent Australia Open you may have noticed Roger Federer was using a brand new racquet, the Wilson Pro Staff Six.One. This Wilson tennis racquet is constructed with a braided combined with the “Ampifeel” technology which makes it one of the best racquets developed by Wilson. The Wilson Pro Staff racquet kept some of the features from the earlier model such as the Basalt fiber (BLX) technology which provides players with an increase in feel as well as frame feedback. When taking an initial look at this racquet, you may not notice any change. However Wilson has made a number of subtle design updates to create the stylish Wilson Pro Staff Six. One. One of the advantages to this racquet is the string spacing in the sweet spot of the racquet. When looking at the three and nine o’clock areas of the racquet you will notice that there are now five strings instead of four across the PWS bar allowing for more kick and better control. With advantages like this, it is no wonder why Federer has decided to use this racquet above all others. The Wilson Pro Staff Six. One also has the “Ampifeel” handle technology which allows the player to have an even cleaner and enhanced feel in the racquet. The “Ampifeel” technology also allows the ability to customize the handle system of the racquet providing additional comfort and support. Designed to help the players with control and to maximize spin this Wilson tennis racquet is an excellent example of stability and maneuverability in one racquet. The dimensions of this racquet also give players an advantage. The 90 square inch head size provides players with the ultimate feel and control for players who wish to take their game to the level of Federer. The Wilson Pro Staff Six. One has a 17mm flat beam frame which provides for an increase in accuracy which is not found among most modern tennis racquets. 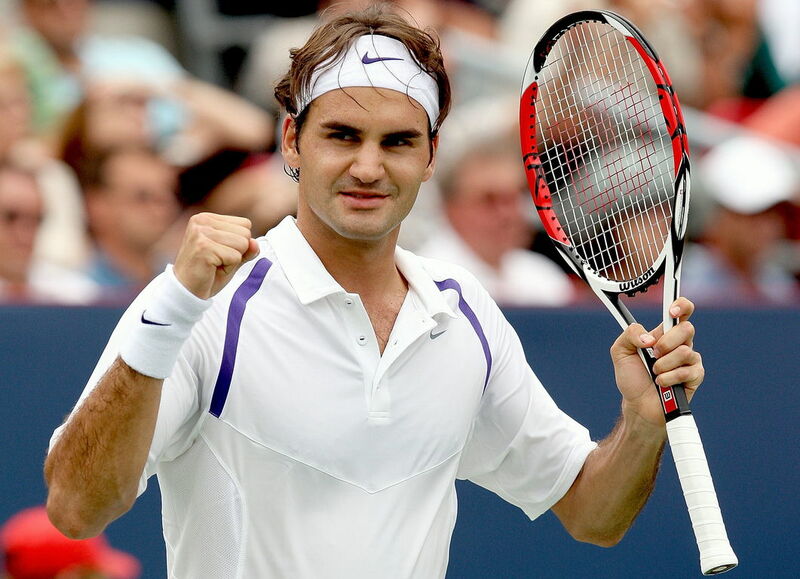 When looking for a new tennis racquet, make the same choice that Roger Federer made with the Wilson Pro Staff Six. One. The Australian Open has been quite a treat: both Roger Federer and Rafa Nadal played on the opening day. Roger Federer and Rafael Nadal sailed into round two, even with Nadal suffering from a bad knee. However, only one of these two can make it to the final. For the first time since the 2005 French Open, both Nadal and Federer are on the same side of the draw. Of course the big news was the public lashing that Nadal gave Federer. Nadal wants more breaks in the schedule for players, and he’s been backing former Wimbledon champ Richard Krajicek to be the next head of the men’s tour. Federer doesn’t agree with either. That probably would’ve been okay if Nadal hadn’t aired his grievances in public. However, he apologized and things seem to be back to normal, whatever that is. A confident (and cocky) Djokovic wore tennis shoes covered with pics of his three trophies and the Serbian flag. He also won his first round. Andy Roddick won his first round match defeating Robin Haase of the Netherlands. Mardy Fish also advanced. By the way, temperatures are reaching 91 degrees Fahrenheit in Australia!